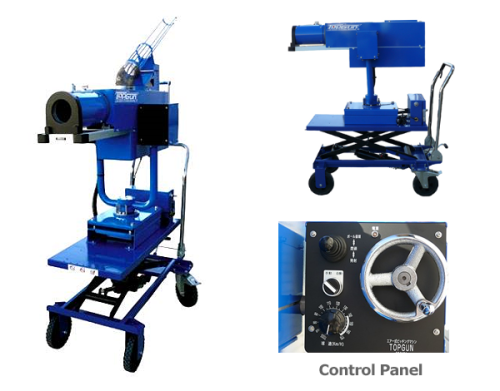 Kyowagiken - Pneumatic Pitching Machine "TOPGUN"
Efficiency – Almost no pre-adjustment is necessary. Machine shoots no wild balls; enables users to start batting immediately. Timing System – Similar to rotary ball shooter, hitting timing is easy to see for batters. Individuals can practice alone using the automatic function and commercial ball feeders. Options – Optional features like blinking lights and mimicked motion of human arm provides various conditional timings. Durability – Minimizing the traditional structural problems like metal fatigue, moving parts, and vibration, TOPGUN has durability on the ball. Manufacturing Japanese Curry from 1926 – House Foods Group Inc. Selling tea and tea utensils since end of Edo period – Senkien Co., Ltd. Leading manufacturer of ignition coils for automobiles – Diamond Electric Mfg Co., Ltd.